"ICO" is a trademark of Sony Computer Entertainment Inc.
A girl who sleeps in a cage of iron. Miyuki Miyabe's first novel was published in 1987, and since that time she has become one of Japan's most popular and best-selling authors. Miyabe's 2007 novel Brave Story won The Batchelder Award for best children's book in translation from the American Library Association. 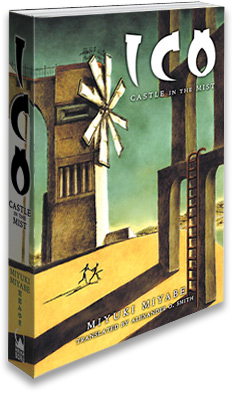 ICO: Castle in the Mist is Miyabe’s seventh book to be translated into English. Toto understood instantly. He wasn’t hiding from whatever it was everyone else had been looking at—he was playing hide-and-seek. Whatever happened to the people in this city had happened so quickly, he hadn’t even had time to realize that he was about to die. Reluctantly, Toto admitted what he had known for some time already. This city was no grand work of sculpture. This was the reason why the mountains in the north were forbidden. This was the curse of the Castle in the Mist. The master in the castle was capable of dooming an entire walled city in the space of a breath. This was what Ico had seen. This was what he meant by “trouble”, why he was so determined to sacrifice himself for the village.